As a pioneer in Japan with 50 years of experience in industrial robot automation, we offer robots for a wide range of applications in various industries. Our expertise includes spot & arc welding, handling, assembling, palletizing, packaging, machine tending, loading & unloading, press tending, painting, sealing, gluing, deburring, grinding, polishing, washing, wafer handling, and clean room applications. 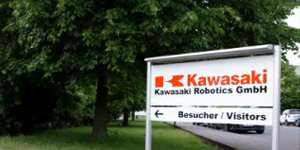 The Kawasaki Robotics GmbH is an overseas subsidiary of Kawasaki Heavy Industries Ltd., Japan. It is the European headquarters and runs the network of distributors for Kawasaki robots. The German sales organization is also located here including the Sales, Service and Engineering Departments. The Kawasaki Robotics (UK) Ltd. is a subsidiary in the UK. With its Sales, Engineering and Service Departments, the company is the perfect partner for the UK market in robot systems.